I have been working on chapatis. Chapati, or roti, is the basic bread of India, according to Julie Sahni in Classic Indian Cooking. I am not sure exactly what is the difference between the two, but I have enjoyed learning how to make them. Chapatis are one of the most basic breads you can make. The ingredients are flour, a little salt, and water. I believe that is what makes them different from flour tortillas - tortillas have some fat in them. I suppose I will have to make those next so I can compare the two. In the meantime, however, these are incredibly easy. The dough takes minutes to prepare, and you can leave it in the refrigerator for a few days, making the chapatis on demand. This is perfect for me, since I do not need 12 chapatis all at once. I make them in batches of 4, and they stay fresher that way. The key ingredient is the flour. It does matter what kind of flour you use. The flour used to make most South Asian flatbreads is atta, milled from durum wheat. It seems to be a cross between whole wheat and all-purpose flour, at least in terms of dietary fiber, as far as I can tell. Whole wheat flour has 4 grams of fiber per 1/4 cup; white whole wheat has 3; atta has 2; all-purpose flour less than 1 gram. So, it is better than all-purpose flour but not the best in terms of fiber. But it is the best in terms of chapati, so I can live with using it just for that purpose. Especially since I mainly eat it with lentils, chickpeas, and other beans which have a lot of fiber in their own right. To make chapatis, you simply mix together the flour with a little bit of salt and then add warm water to the flour. You want enough water to make a moist dough that is not too wet. 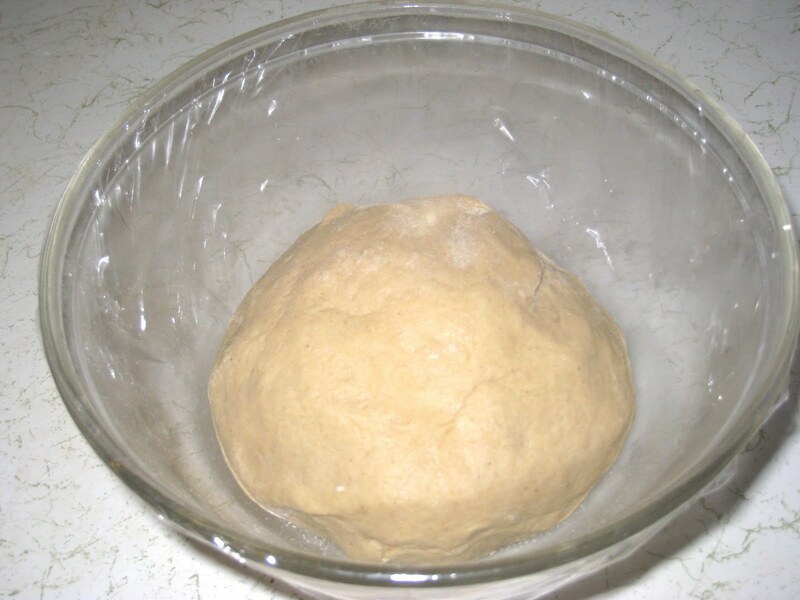 You knead the dough until it is smooth, and then you put it in a floured bowl and let it rest for about 30 minutes so the gluten fibers can relax. This makes the dough easier to roll out. After it has rested you divide it into 12 balls about the size of a golf ball and roll them out. If I am not going to make them right away, I will put the balls into a bowl and lightly cover them with flour. I let them come to room temperature before rolling them out and cooking them on the stove top in a cast-iron pan or griddle. Of course there is a pan made especially for this purpose, but I have found them easy enough to make in my cast iron skillet. I have heard that the sign of a "true" chapati is that the air causes it to swell into a big bubble when you turn it over. I wish I could say that this example is the norm, but I was actually just really lucky with this one. Most of them do swell up some, but I have not yet reached the level of expertise that makes them do this every time. No worries, though. They will taste just as good if they do not puff up for you. Combine flour and salt in a medium size bowl and whisk together to disperse the salt throughout the flour. Add the water in a slow stream, about 3/4 a cup at first, and mix together until a dough forms that is moist, but not wet. Place a cast iron skillet, griddle, or ava over medium-high heat. If it starts to smoke, lower the heat. It is ready when a drop of water sizzles on contact. Divide the dough into balls the size of golf balls. Place a ball between the palm of your hand and your fingers and, rotating the dough, use your fingers to flatten out the dough into a disk. Place on a lightly floured surface and use a rolling pin to roll out the disk until the dough has reached the desired thickness, adding small amounts of flour as needed. The chapatis should be no more than 1/8-inch thick. Remove as much flour as possible and pace the chapati in the pan. Let it cook until air pockets have started to form, about 2 minutes, and then turn it over. 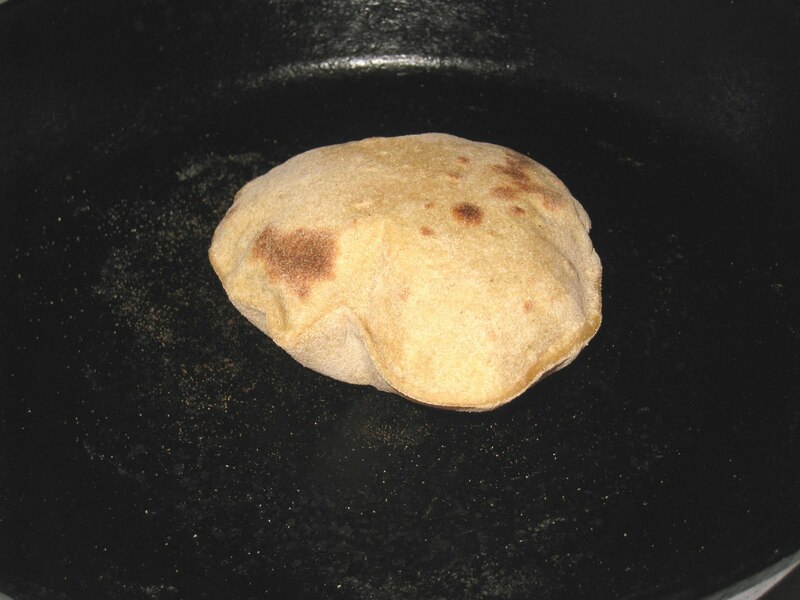 Using a spatula (or a towel with your hands if they can stand the heat), press down slightly around the edges of the chapati so it can puff up as much as possible. Cook for another minute or so, until light brown spots have appeared on the bottom. 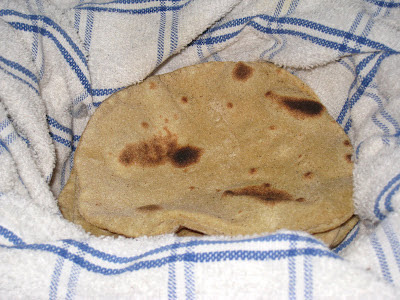 Place the cooked chapatis in a towel that has been placed inside a glass or metal container and cover well after each one to keep them nice and soft. If desired, brush a little oil over each chapati after it is cooked. Cooked chapatis will last a day or two, but they are best eaten right after they have been made. I used to love getting chapatis at a local restaurant in college. Never tried making them at home but may just have to give it a try. You really should, Lisa. It might take a few times for you to get the hang of it, but it is well worth it because they are so quick and easy to make. I will even have them for a quick snack with peanut butter. Just make sure you use atta flour; regular whole wheat won't work nearly as well. Thanks for stopping by Cooking without a Net! I Dream of "Jiro Dreams of Sushi"